This Octopus Pirate's Chest Jewelry Box measures 5" long, 3.25" tall and 3.25" wide approximately. The box is 1.75" deep. Tea light candles in photos are not included. This Octopus Pirate's Chest Jewelry Box is made of designer polyresin, hand painted and polished individually. Looking for an exotic collectible that can store your business cards, jewelry, paper clips and select stationery on your desk? This pirate skull chest will meet your need! Individually hand painted and polished on resin medium, this collectible will draw attention from all eyes that see it! This box does not have a locking feature. 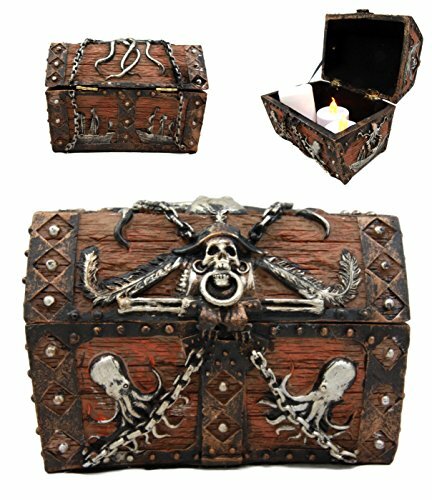 This Octopus Pirate's Chest Jewelry Box is an Atlantic Collectibles exclusive collection.